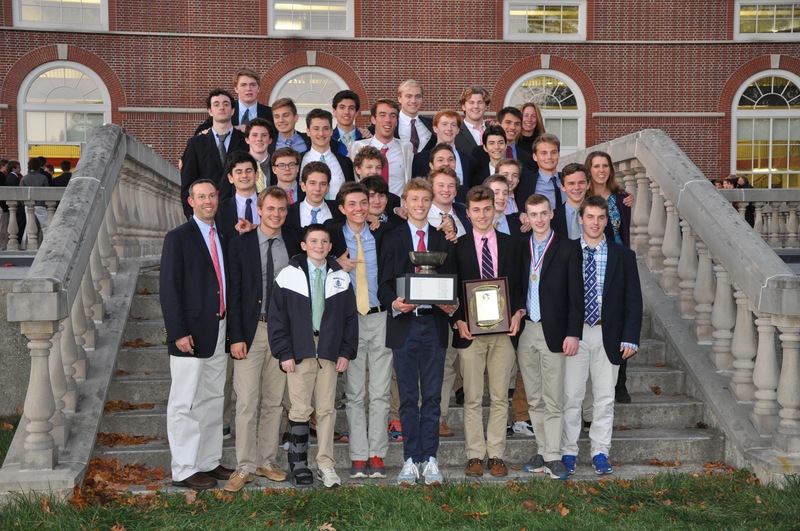 Led by captains Andrew Kaneb ‘17 and John Pappo ‘18, the cross country team raced to their first league title since 2010, defeating league powers Nobles and St. Mark’s to earn sixty-nine points in the championship race at Groton on November 5. Quinn McGaugh ‘18 (4), John Pappo (7), and Charlie Donahue ‘19 (12) placed within the Top 15 overall in the Varsity race. Eric Whitehead ‘18 (5) and Bennett Morris ‘18 (9) placed within the Top 15 in JV with Andrew Berg ‘18 winning the race with a 5K time of 17:54. The secret to the team’s championship fall was the depth and parity in the thirty-man roster. Often met with setbacks of injuries, runners filled the gaps in the Varsity and top JV spots. Jack Daley ‘17, Andrew Berg, Bennett Morris, John High ‘19, and Nick Daley‘19 made a heavy impact in their rookie seasons; J. Daley and High anchored the Top 5, while Berg, Morris, and N. Daley all stepped up to compete with Varsity. The team’s combination of long-distance runs, tempo pieces, and track workouts pushed them to be the fittest in the league. September gave runners a heavy dose of mileage to build a solid foundation for the season; workouts transitioned into shorter, faster pieces for the last month of the season to prime conditioning for the ISL championship. Coaches Trautz, Vailas, Harder, and Rice emphasized “team-running” and grit, stressing the importance of pack running, team support, and mental toughness in practice and races. “You can do anything for twenty minutes,” Coach Trautz often reminded the team. The squad finished their regular season at 12-4, with losses to Nobles, St. Mark’s, St. Paul’s and ISL newcomer Tabor. Last Saturday, the team posted its best finish ever at the NEPSTA Division 1 Championships at Phillips Exeter, finishing 4th overall in the Varsity race and 6th in the JV race. Quinn McGaugh ‘18 placed fifteenth in the Varsity race with a blistering time of 16:54. With a strong lineup of John Pappo, Quinn McGaugh, Charlie Donahue‘19, John High ‘19, Eric Whitehead ‘18, Bennett Morris, Andrew Berg, Jackson Stone ‘19, Nick Daley, and John Markis ‘18, the team has already set its sightson repeating as champions next fall.